"Everything's coming apart!" Amazon Studios has debuted the first official trailer for Woody Allen's latest film, titled Wonder Wheel, indeed set around Coney Island in the 1950s and the famous "Wonder Wheel" Ferris wheel. The story in the film is told by a lifeguard who dreams of being a playwright and is another ensemble piece about various people around Coney Island. The various characters include Ginny (played by Kate Winslet), an emotionally volatile former actress now working as a waitress in a clam house; Humpty (played by Jim Belushi), Ginny's "rough-hewn" carousel operator husband; Mickey (played by Justin Timberlake), a handsome young beach lifeguard; and Carolina (played by Juno Temple), Humpty's estranged daughter hiding out in her father's apartment. The cast also includes Max Casella and Geneva Carr. This looks quirky and dramatic, as usual from Woody Allen. Take a ride on the Wonder Wheel below. Wonder Wheel tells the story of four characters whose lives intertwine amid the hustle and bustle of the Coney Island amusement park in the 1950s: Ginny (Kate Winslet), an emotionally volatile former actress now working as a waitress in a clam house; Humpty (Jim Belushi), Ginny’s rough-hewn carousel operator husband; Mickey (Justin Timberlake), a handsome young lifeguard who dreams of becoming a playwright; and Carolina (Juno Temple), Humpty’s long-estranged daughter, who is now hiding out from gangsters at her father’s apartment. Cinematographer Vittorio Storaro captures a tale of passion, violence, and betrayal that plays out against the picturesque tableau of 1950s Coney Island. 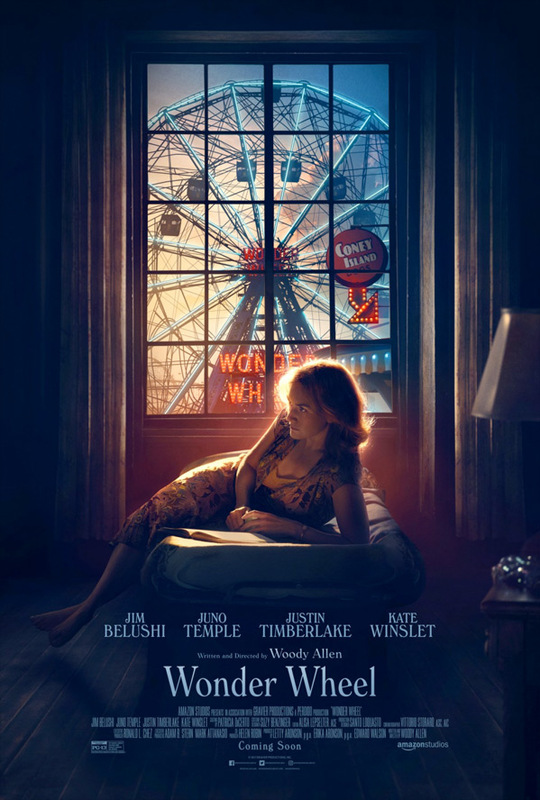 Wonder Wheel is the latest film written & directed by the legendary Woody Allen, of Midnight in Paris, Match Point, Scoop, Cassandra's Dream, Vicky Cristina Barcelona, Annie Hall, Manhattan, To Rome with Love, Blue Jasmine, Magic in the Moonlight, Irrational Man, and Cafe Society. This premieres at the New York Film Festival. Amazon will then open Wonder Wheel in select theaters starting December 1st. Thoughts?